I woke up on Thursday for work and thought, “I’d rather be in bed.” Then I remembered it was December, and life was good again. What some people fail to understand is that Christmas is not restricted to December 25; Christmas is a season of its own, and it comprises the entire month of December, and occasionally the last week in November if you’re feeling overly ambitious. Unfortunately, if you’re living in a predominantly Muslim country, Christmas really doesn’t have much of a place. So I was thrilled and surprised to spot some Christmas trees blinking miserably along the railroad tracks the other day and promised myself I’d sacrifice some of my grocery money to purchasing a fake tree. Last night, Simon and I headed over to Ryan’s to watch the first Christmas movie of the month. I marinated some chicken and Simon brought “spuds” – some of which he bestowed upon a beggar girl in the street en route to Ryan’s – and we headed over to the rooftop where Ryan strapped a spelunking headlamp on and grilled up the chicken. He thought Simon would like Bad Santa, which I’d never actually seen, but Simon confessed that he wasn’t a fan. It was fun to watch it with him, though, as he frequently wondered if some of the events pictured in the movie occurred often in the US. The stress levels are a bit high lately, what with exams coming up and 6 instructional days left in the trimester. My kids were in rare form today, and the traffic was so bad on the ring road that our commute home lasted nearly an hour and a half. I shirked fitness training and loafed around the apartment until Susannah got me to go to Shannon’s softball game, and she had to bribe me with pasta salad to accomplish this. Still, it was fun to watch, and we picked up a Christmas tree by the train tracks on the way home. I got him to throw in the Christmas lights for an extra 10LE (a bit over $1US), but I’m still a terrible haggler. 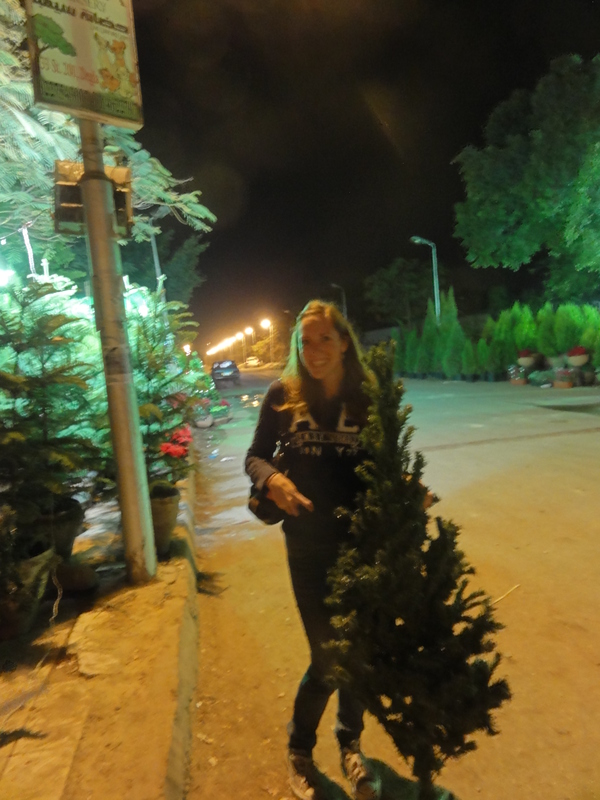 As I haggled, Susannah called across the road that a smaller tree with three strands of lights on it was going for 80LE, lights included. I wanted the large tree, though, so we paid and I carried it all the way home. In other news, the next phase of elections begins tomorrow. We’ve heard that the Muslim Brotherhood is in the lead, but who knows? We have school, although I’ll be on a field trip. Nothing says Christmas and December quite like a sandboarding field trip. I’ve wanted to try sandboarding since my students wrote about it in their timed narratives, so we’ll see how this goes. I can’t complain. Pictures to come!